Establishment Division had through their letter dated 09.02.2017 informed that a formal proposal of M/0 Defence had been received. 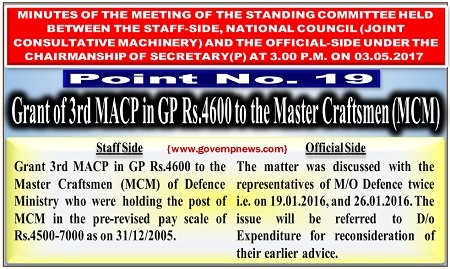 The matter was discussed with the representatives of Mb° Defence twice i.e. on 19.01.2016, and 26.01.2016. The issue will be referred to D/o Expenditure for reconsideration of their earlier advice. The Staff-Side expressed satisfaction with the action taken. It was decided that the item may be closed.